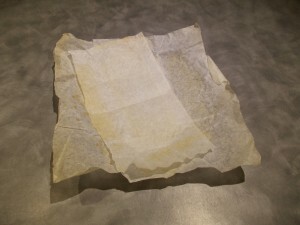 My first bits of rubbish this week: 2 pieces of waxed baking paper used in baking bread for today’s orders. And no, I’m not saying that I didn’t make any waste at all, its just that anything that I did make was all either recyclable or compostable/chook scraps so it went down different waste streams. This entry was posted in WasteManagement. Bookmark the permalink.